From left, Anne Costner, Pat Smith, COO Ocean Therapy Solutions, John Houghtalking, CEO of Ocean Therapy Solutions, actor Kevin Costner, founding partner of Ocean Therapy Solutions and Doug Suttles, COO of BP Exploration and Production, talk aboard the barge holding Ocean Therapy's centrifuge machine designed to separate oil and water in Port Fourchon, La. Friday, June 18, 2010. WASHINGTON, D.C. - Actor Kevin Costner pitched Congress Wednesday on what he called an $850 million "no-nonsense approach" using a fleet of 190 state-of-the-art vessels to quickly respond to any oil spills. Testifying before the House Homeland Security Committee, Costner compared the efficiency of his plan of standby vessels to the 6,000-vessel response used to contain the BP oil spill in the Gulf of Mexico. Many of the boats used by BP were vessels captained by fisherman idled by the spill. The British-owned company struggled to contain the oil after the Deepwater Horizon exploded off the Louisiana coast on the night of April 20. The accident left 11 workers dead and set off a massive spill that ultimately led to more than 200 million gallons of oil spewing from BP's undersea well. Costner, known best for his roles in the "Field of Dreams," "Bull Durham" and "Dances with Wolves," described his approach to dealing with such a spill, including separating the oil from the water and recovering it, using boats and crews specifically designed for that purpose. "We can choose to enlist a fleet of 6,000 vessels that are hampered by their lack of training and preparedness, or we can create a dedicated fleet of 190 state-of-the-art vessels," he told the panel. "We can choose to let oil come to the surface and mechanically recover it as a saleable asset or we can burn it. We can choose to separate oil from water at high speeds at output that exceeds the EPA standard and improve the efficiency of every boat on the water or we can use dispersants and sink it to the bottom. We can choose to recover oil or we can choose to cover it up." Costner told the panel startup costs would be $850 million and then up to $150 million a year to maintain readiness. His company, Blue Planet Solutions, earlier estimated startup costs at $895 million. 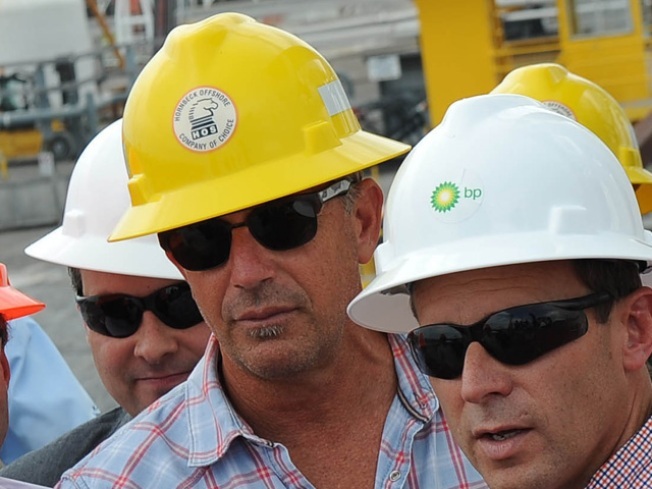 "America deserves a no-nonsense approach to spills," Costner declared. A separate $1 billion oil-industry plan would trap spilling oil underneath the sea. Costner became involved in the Gulf spill when he persuaded BP to buy 32 of his company's machines that separate crude from the oil-water mixture taken from the Gulf. Blue Planet expects the project would involve continued collaboration with the University of California, Los Angeles as well as retrofitting by Louisiana-based Edison Chouest Offshore, the construction of new shallow-water skimmer boats by Houston-based Hornbeck Offshore and work by other companies, the Houston Chronicle reported. Costner earlier submitted his proposal to Bureau of Ocean Energy Management, Regulation and Enforcement Director Michael Bromwich during a meeting in Mississippi last week, the New Orleans Times-Picayune newspaper said. He also has discussed it with Gulf Coast governors and members of Congress during the past few weeks, the paper said.